<font color=""#0000FF"">Combined Thermometer, clock and timer. 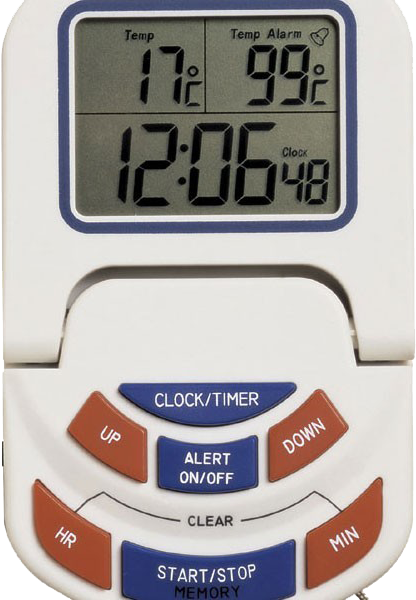 Combined clock, countdown timer and oven thermometer that displays both the actual and the alarm temperature over the range of 0 to 300°C and simultaneously the countdown or the actual time. The kitchen timer will count down or up from/to 23 hours, 59 minutes and 59 seconds, the real time clock will display the time in either 12 or 24-hour format. 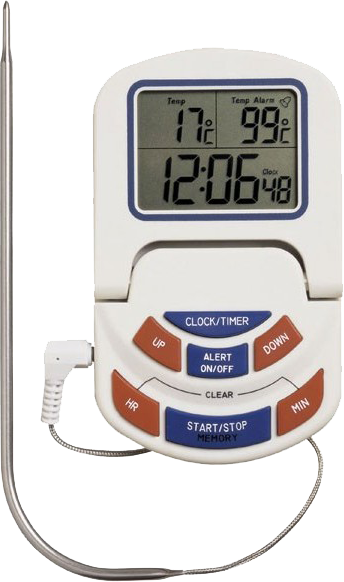 The kitchen thermometer features an audible high alarm that can be set from the simple to use seven-button keypad. The alarm temperature is continuously displayed. The unit is designed to sit on a worktop or can be attached to an appliance via the magnetic pads at the rear of the instrument. The thermometer is supplied with a high temperature probe and a one metre stainless steel braided lead. The insertion length of the probe is 150mm (Ø4mm) and incorporates a reduced diameter tip to aid response time.